The Modero 36 in. vanity has a simple clean design with a chic Chilled Gray finish and brushed nickel hardware. It is constructed of solid poplar wood and veneer with soft-close doors and drawers that showcase its quality. Match it with the natural beauty and durability of a stone top and you create the perfect vanity ensemble. Add understated elegance to your bathroom with the Delano Collection. Spare in style, we designed Delano to accent a range of bathroom dicor, blending simple beauty with unmatched versatility. Whether you choose the Taupe Glaze or White Finish, the 24-inch Delano features a durable solid wood frame and sophisticated black bronze pulls, 1 flipped down DWR and 2 functional DWRs. Pair Delano with one of our natural stone tops and matching mirror to create the bathroom of your dreams. 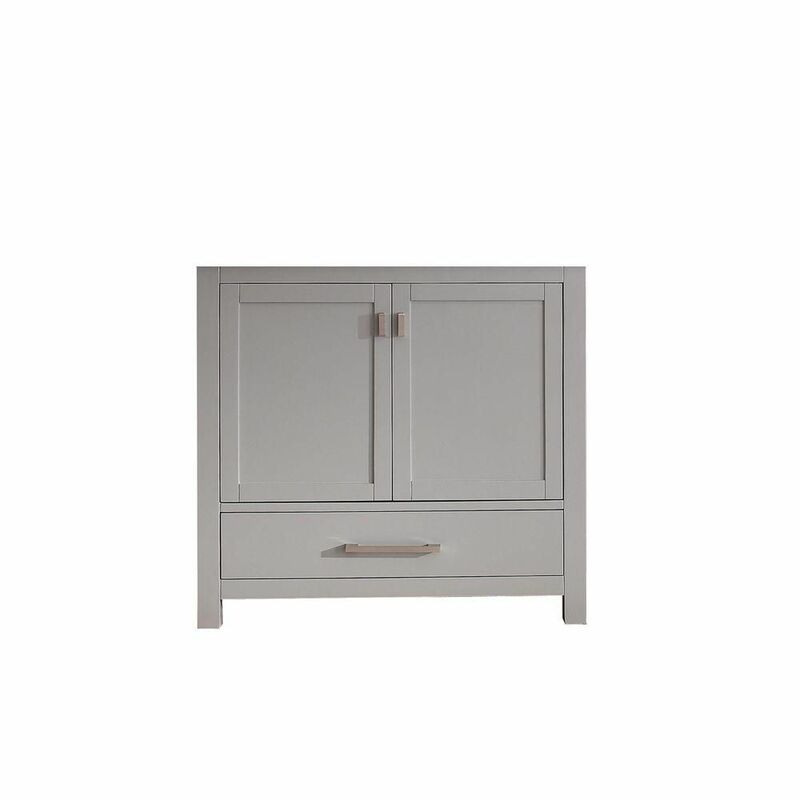 Modero 36-Inch Vanity Cabinet in Chilled Grey The Modero 36 in. vanity has a simple clean design with a chic Chilled Gray finish and brushed nickel hardware. It is constructed of solid poplar wood and veneer with soft-close doors and drawers that showcase its quality. Match it with the natural beauty and durability of a stone top and you create the perfect vanity ensemble. Modero 36-Inch Vanity Cabinet in Chilled Grey is rated 5.0 out of 5 by 1. Rated 5 out of 5 by Larry from Perfect vanity Arrived quickly and fit is perfect. Construction with real wood is very good. Coloring/paint job is perfect. Installation will be a snap.